Food takes the front stage when it comes to any event. However, it’s still difficult for event organizers to find incredible, vetted, and up-and-coming food vendors efficiently and seamlessly. Feast It is changing that. The online platform features a selection of the UK’s hand-picked top caterers and mobile bars – less than ten percent of food suppliers are selected to be on the platform. Users can book these vendors to provide catering for any type of event ranging from a music festival to a corporate party to a celebrity birthday. 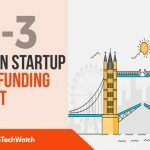 London TechWatch sat down with cofounder and CEO Digby Vollrath to learn more about how his experience in the music festival industry gave him the understanding to create this exclusive platform that takes out one of the major pain points of event planning – food and the company’s recent round of funding. It was a £1.7M Seed round led by Jon Claydon, who is the ex-Head of advertising agency Claydon Heeley Jones Mason. 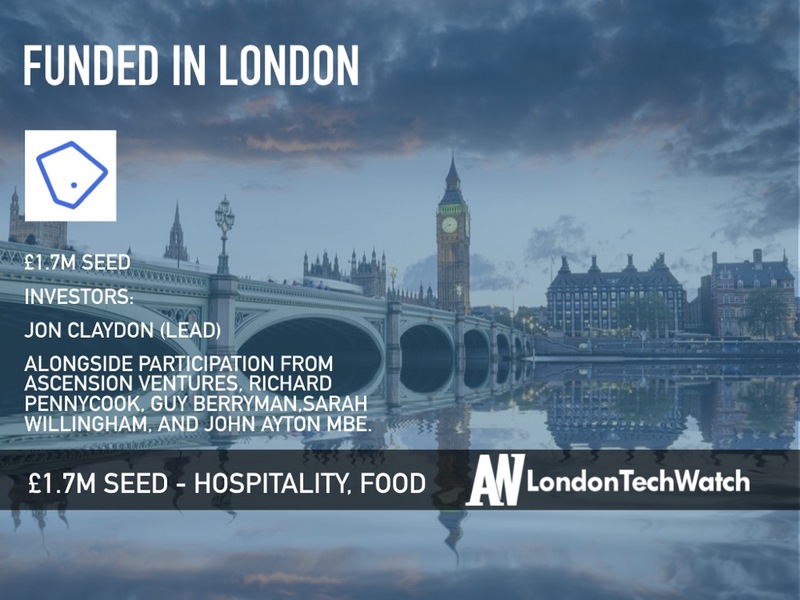 Other investors included Ascension Ventures, Richard Pennycook (shareholder and previous Chairman in The Hut Group), Coldplay member Guy Berryman, serial entrepreneur and star of Dragon’s Den Sarah Willingham, and John Ayton MBE. Tell us about the product or service Feast it offers. Feast It launched in 2017 and we now have a closely curated list of more than 650 of the UK’s top caterers and mobile bars, available to book for any event. All of our suppliers have been hand-picked, with fewer than one in ten accepted onto the platform, creating a carefully vetted community of suppliers. 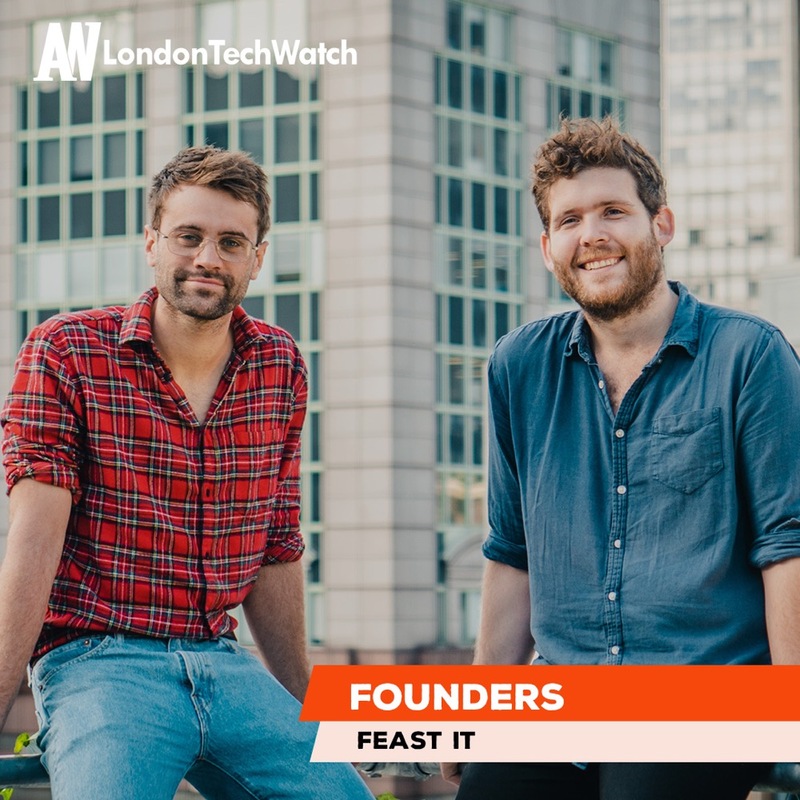 Household names like Patty & Bun, Soho House Group, GRIND, and Honey & Co work with Feast It, as well as many smaller, up-and-coming businesses. Our suppliers are diverse; they can provide top quality banquet-style dining, table service or street food served from a variety of unusual setups including food trucks, Airstreams, horseboxes and more. What inspired you to start Feast it? I was working in the music festival industry at the time when Hugo and I first dreamed up Feast It, and it all came from understanding how big the pain points are when you’re trying to find amazing suppliers for an event. We realised that there was this complete disconnect between all of the incredible suppliers out there and all of the incredible events. The best suppliers were struggling to find the best events and vice versa. We wanted to build something that would work as well for our partners as it does for our clients – where clients could get access to the best pool of suppliers in the country, from big cheesy burgers to Michelin star Indian. At the same time, we wanted to create a network of incredibly talented people who might not know how to get the best gigs, but through Feast It, they would be able to access events that included: weddings, celebrity birthdays, music festivals, and big corporate bashes. What market is Feast It targeting and how big is it? Honestly, we think the events industry is broken. For clients, it’s confusing, overly complicated, and designed to prey on people who aren’t sure where to begin. From the start, we’ve wanted to build a platform that demystifies everything from pricing to logistics and takes the pain out of planning your next party. The events industry is worth more than £55B in the UK and runs into hundreds of billions when you start looking across the pond. For what type of party or event is your platform best suited for? Although we can cater for intimate parties with as few as 30 guests, most of our bookings are for larger events of hundreds – or sometimes even thousands – of people. Our suppliers can cater any type of event from weddings, birthdays, company parties, or even festivals. In 2018, we catered London Pride. One thing’s guaranteed: we always offer the same great service, no matter the event size. We operate an online marketplace business model. For this round it was pretty painless, we have a pretty amazing network of investors built up over the last 18 months who’ve never been anything but supportive. We found they’ve opened a lot of doors for us on this round, and we managed to get everything closed pretty swiftly. 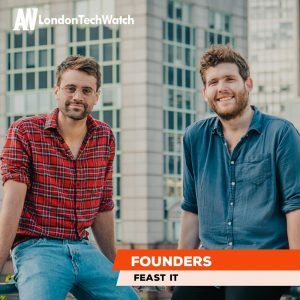 To start with it was all about building a network, Hugo and I were 24 when we started raising for Feast It and our network in the startup space was zero. We had to hustle very hard to meet people in the investment space, learn the lingo, and just work out how to build a deck or business model. It was a lot of cold emailing and begging for advice from anyone who’d listen. When investing at this early stage, the recurring theme is: investors are investing in the idea, proven growth, but most importantly the management team. We’ve been really lucky with the first two, especially when it comes to growth. We managed to grow our enquiry volume by over 1000% from 2017 to 2018. On the management team, we worked really, really hard on identifying where Hugo and I are weak, which enables us to find the best possible people to come in and blow us out the water. 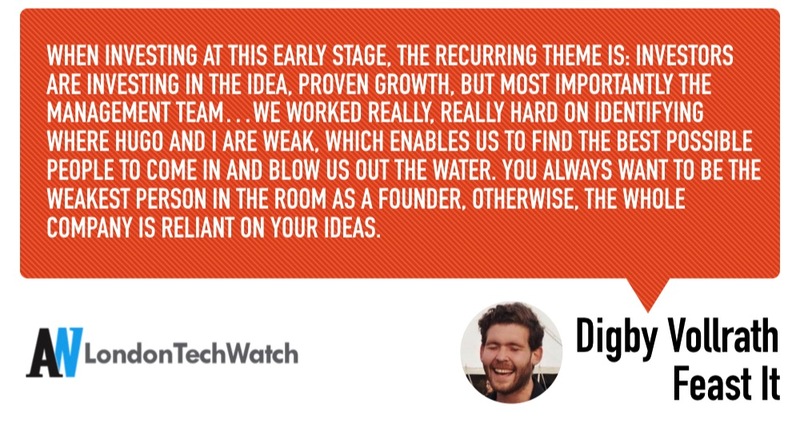 You always want to be the weakest person in the room as a founder, otherwise, the whole company is reliant on your ideas. In the lead up to summer, we’re targeting rapid growth. We’re rolling out a new set of products over the next six months, including a brand new restaurant-style catering product which will have over 50+ insane, new suppliers coming on board. These new suppliers offer something a little different from our fantastic street food suppliers. We’re also aiming to have complete UK coverage, including Northern Ireland, by mid-summer. If that wasn’t enough, we’ve got some punchy targets for what we want to be making in revenue for each of our partners. Find ways to cheat your way to growth. In our first 6 months, we were completely non-digital in our growth strategy – we literally said yes to everything. We bit off a lot more than we could chew and called every single event planner in London every week, begging for scraps. It meant that we pretty quickly built up a strong set of networks and had managed to get recurring revenue well before really understanding how to run digital ads. 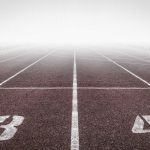 It’s two-sided – for our clients, we want to really flesh out what we’re offering and reduce the friction they may be feeling in our booking flow. Our ambition has always been to make planning your wedding or office party completely seamless, whilst adding a huge amount of additional value. For our suppliers, it’s making sure that each month we’re raising the average amount each of them is making through us as a partner. The Blind Beggar in Whitechapel, it’s by the office, has a carp pond, and is steeped in East End legend. They also have the most hilarious pub cat.